Friedrich Schröder-Sonnenstern spent his adolescence in and out of correctional institutions for delinquent behavior. In 1910, while working as a farm laborer, he was arrested for threatening a police officer with a knife and confined to a mental hospital for five months. He worked for the postal service during World War I, but his job was terminated in 1917, when he was caught smuggling. He was then re-institutionalized until the end of the war. After the war, Schröder-Sonnenstern became a self-anointed astrologer, healer and clairvoyant, calling himself “Esteemed Professor Dr. Elliot Gnass von Sonnenstern, Psychologist of the University Sciences.” In 1930, he was arrested for practicing false medicine and confined, yet again, to a mental institution. There he met an artist who inspired him to draw. At the age of fifty-seven, Schröder-Sonnerstern turned to art in earnest, when a knee ailment temporarily kept him from walking. 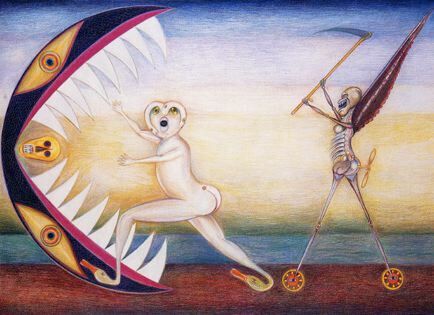 His works, filled with fantastic images drawn in a hard-edge style, reflected a private mythology in which the moon was equated with the underworld and the sun with enlightenment. Social disorder and sexual imagery filled his fantastic visions. By 1959, Schröder-Sonnenstern had attracted the attention of influential patrons and was exhibiting and selling his work to much acclaim. In 1964, when his mistress, Aunt Martha, passed away, the artist started producing less work and his prices soared. In 1973, the Kestner-Gesellschaft in Hannover held a Schröder-Sonnenstern retrospective.